The ancestors of the modern guitar, like numerous other chordophones, can be traced back through manifold instruments, and thousands of years, to ancient central Asia. Guitar-like instruments appear in ancient carvings and statues recovered from the old Persian capital of Susa. This follows that contemporary Iranian instruments such as the tanbur and setar are distantly related to the European guitar, as they all derive ultimately from the same ancient origins, but by very different historical routes and influences. During the Middle Ages, instruments with three or four strings, and known as "guitars", were present, although their construction and tuning was different to that of the modern guitar. The Guitarra Latina in Spain, had curved sides and a single hole. The Guitarra Morisca, which was brought to Spain by the Moors, or at least was heavily influenced by Moorish instruments, had an oval soundbox and many sound holes on its soundboard. By the 15th century, a four course double-string instrument called the vihuela de mano, that had tuning like the later modern guitar except on one string and similar construction, appeared in Spain and spread to Italy; by the 16th century, a fifth double-string had been added. During this time, composers wrote mostly in tablature notation. In the middle of the 16th century, influences from the vihuela and the renaissance guitar were combined and the baroque five string guitar appeared in Spain. The baroque guitar quickly superseded the vihuela in popularity in Spain, France and Italy and Italian players and composers became prominent. In the late 18th century the six- string guitar quickly became popular at the expense of the five-string guitar. During the 19th century the Spanish luthier and guitarist Antonio de Torres gave the modern classical guitar its definitive form, with a broadened body, increased waist curve, thinned belly and improved internal bracing. The modern classical guitar replaced the older form for the accompaniment of the song and dance called flamenco, and a modified version, known as the flamenco guitar, was created. Today's modern classical guitar was established by the late designs of the 19th-century Spanish luthier Antonio Torres Jurado. Torres guitars are divided into two periods. The first, belonging to Sevilla from 1852–1870; the second being the years 1871-1893 in Almería. The guitars Torres made were so superior to those of his contemporaries that their paradigm changed the way guitars were built, firstly in Spain, and then in the rest of the world. Although they are not particularly loud by modern standards, they have a clear, balanced, firm and rounded tone that projects very well. His guitars were widely imitated and copied. Because he never signed his guitars, and only numbered those from his second era, many fake Torres have been made, some by well-known and expert makers. 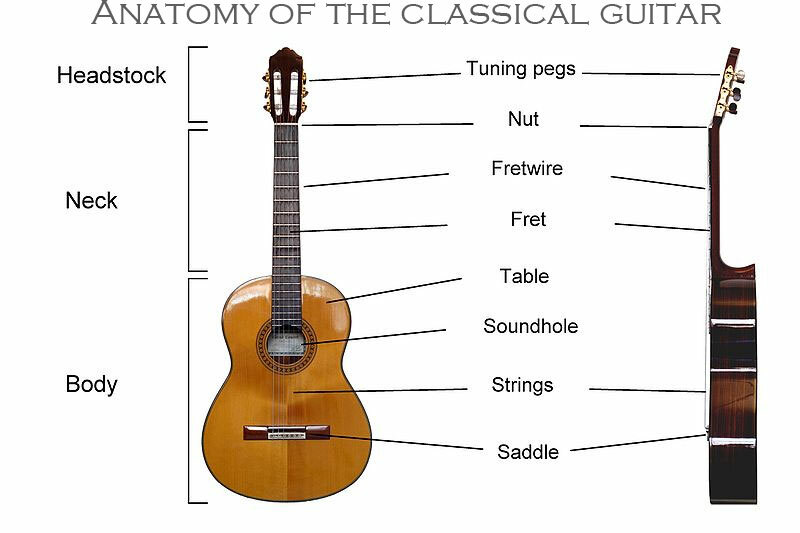 While the overall pattern of the modern classical guitar derives from Torres, there are some differences between Torres' classical guitars and the modern instrument. Most importantly, Torres' guitars all had soundboards of European spruce (Picea abies). Today spruce has largely been supplanted by Western red cedar (Thuja plicata), except on those of high-end concert guitars; and many of these have cedar soundboards as well. Luthiers have continued to develop the bracing of the soundboard, but most still use some version of the fan-bracing that Torres' pioneered. Torres' guitars were strung with gut trebles and basses of silk threads, overwound with silver. Since the 1950s almost all classical guitars have been strung with nylon. The tuning heads of Torres' guitars were often set with traditional ebony pegs, similar to those of other string instruments. His later instruments were fitted with mechanical tuners, which are universal on classical guitars today. WHAT IS THE TRADITIONAL SPANISH SYSTEM? It is a system of guitar making, that is characteristic in Spain and which is applied to all spanish guitars that are made here. Using this method, part of the guitar neck remains inside the body when the guitar is built, creating the “Spanish heel”. WHY A GUITAR MADE WITH THE TRADITIONAL SPANISH SYSTEM? 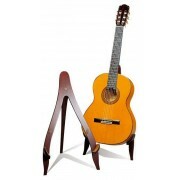 This system guarantees a better construction of the classical guitar and the flamenco guitar than those that use a joining system to attach the neck to the body, like making a piece of furniture. Apart from the sonic advantages, it offers a far better stability and durability of the instrument. The "Spanish heel" is a construction feature most commonly associated with Spanish-made classical guitars. In this style of construction, the neck is notched at the heel to receive the sides, and the body is built around the neck and side assembly. The result is a very solid neck mounting, because the entire body is built around the end of the neck. Indeed, it is the ideal method of construction.